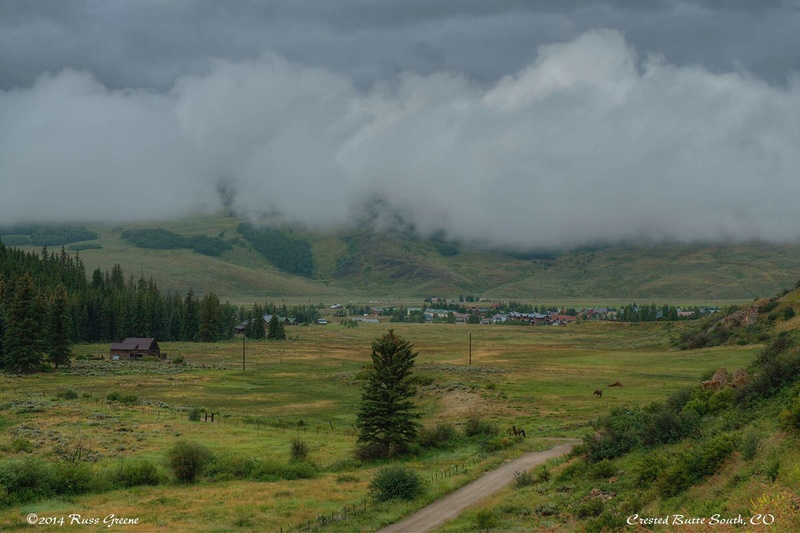 Crested Butte, Colorado, is a small town. 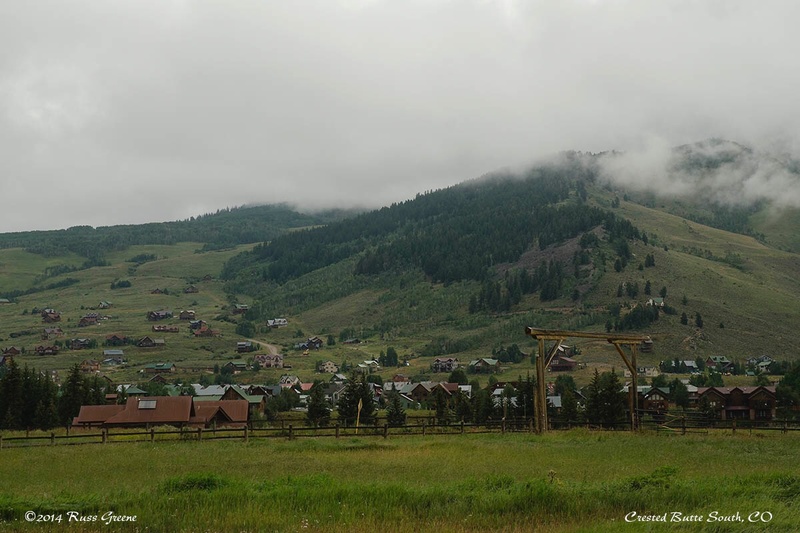 Its satellite Crested Butte South, some 7 miles south of Crested Butte, is a really small town. There are three businesses there: a liquor store (thank God for that right? ), a general store/gas station/cafe, and Camp 4 Coffee where I’d say you can get the only coffee in town but I expect you can also find a cup over at the general store/gas station/cafe. I suppose you could call CB South a bedroom community and a good percentage of the homes there are second homes, vacation spots for people who want to summer there, or winter there: there are outdoor activities to enjoy year round in the area. I parked my RV at Cement Creek Campground a few miles up Cement Creek Road outside of CB South and over the next 5 days or so rode my little motorcycle PeeWee into town on several occasions to avail myself of the free wifi at Camp 4 Coffee not to mention their absolutely fabulous brew. While hanging around Camp 4 Coffee I met a few locals, one of whom I later discovered is an author of some repute, Craig Dirgo, who has penned a number of spy thrillers including The Einstein Papers. Craig was very helpful to me, suggesting places to see and routes to drive in Colorado. His advice was excellent. Thanks, Craig! Another local I met was Nicole Reycraft. If you’ve read some of my interviews you may know that I enjoy talking to locals, especially in small towns, especially if they were born and raised there, especially if they had also lived in other, larger cities or towns and chose to return to their roots. Nicole fits that bill, so I was pleased when she consented to talk with me for a while and explain what life in CB South was like, how it compared to other places, and why she has chosen to remain. Now 26 years old Nicole says she had and incredible childhood in CB South and she loved it. I wonder how much that has to do with choosing where one wishes to live, if they wish to stay close to home or seek out other corners of the world. The town was smaller when she was a child. In the warmer months kids “played naked in the winter drainage making mud pies”. She grew up hiking and camping, and using her imagination, which I suppose is called upon more in remote locals where there are fewer distractions and store-bought toys are less available. There is no Toys R Us in CB South, no toy store and perhaps not even a toy at the genral store which is tiny and doesn’t have much of anything as I recall noting upon my brief visit there. Nicole explained they never had a bowling alley, movie theaters came and went (that comment may have been to the larger Crested Butte up north because I can’t imagine CB South having theater), and there weren’t a lot of organized events for children like you find nowadays in larger communities. She was home-schooled until she was 11, played in teepees and made forts; kids (or their parents) made their own prairie dresses and bonnets and played games like Oregon Trail. Store bought toys were a rarity. She confesses to being something of a tomboy–she played football with the boys and was known as “The Bulldozer” for having broken bones of the opposition. She had a girly side too, admitting to an obsession with baby dolls. Nicole attended Colorado College and Western State College. She holds a bachelor’s degree in Communication and Theater and plans to start work toward a master’s degree in education or writing next spring. I joked that with those as potential majors it seemed she wanted to be poor to which she replied “I live here too which means I’m probably going to be poor, which is OK because I’m rich in many other things here. I have all my family here and I love it more than anything.” Who can argue with that? I explained my curiosity about what the social life was like in such a small town and asked about it. Not surprisingly she has a boyfriend, especially considering the ratio of men to women in CB South is something like 3 to 1. “The men here are all very able bodied, strong, handsome, talented, extreme men which is great. The women like to call it Peter Pan land. The social dynamic here is play very, very hard, party very, very hard, work very, very hard. Everyone works really hard here for the most part. People work their butts off here.” Clearly I wouldn’t fit in! Nicole’s dad also grew up in the area and her grandfather, although born elsewhere lived there too. This makes her a 3rd generation Reycraft “in the valley”. “I’ve got aunts and uncles here, cousins, great aunts, grandparents…” she says. Nicole mentioned a few of the family names belonging to the “high class” folks in the area and jokingly referred to her family name as being known as “the more derelict side of town… the kids who lit barns on fire, the grandpa who was sheriff for a day but was too drunk to do his job…” When I asked if those things were true she said yes, laughing. Nocole’s closeness to her family is evident by the tattoo work adorning her body: the names of all her siblings and her mother’s favorite bird. Her love of the Crested Butte area is also evident via the Mt. Crested Butte tattoo. 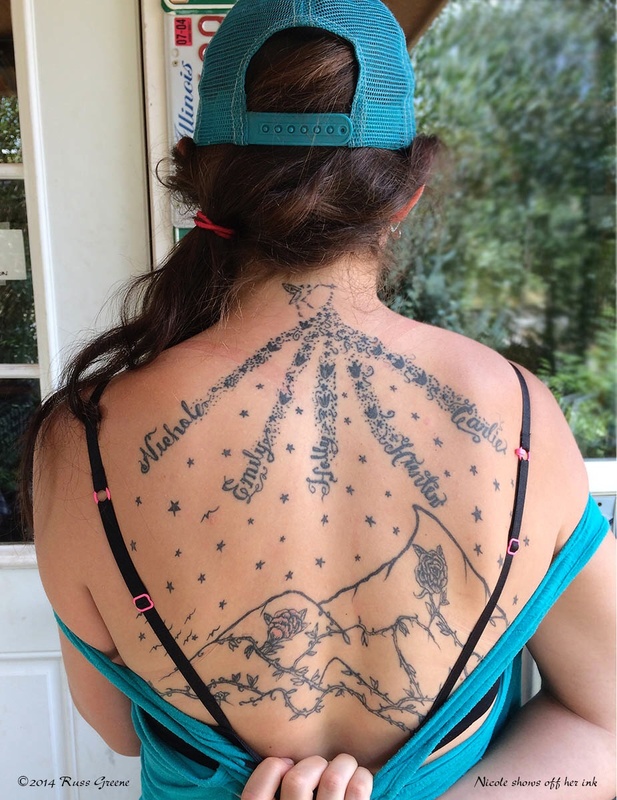 A modern girl, Nicole has the names of her 5 siblings tattooed on her back, along with a likeness of Mt. Crested Butte, some roses, and her mom’s favorite bird, the chickadee, on her rib cage. Her siblings range from 30 years old down to 11, most if not all live locally. I didn’t find out for certain. Her 30 year-old brother whom she didn’t know she had until recently, the result of a parental dalliance on the east coast, just became a dad two days before this interview, making Nicole one very excited first-time aunt. While divorced, both of Nicole’s parents live in the area. Nicole works at Camp 4 Coffee 5 days a week, loves the job, and also works at a preschool 3 afternoons. She loves kids and is ready to become a mom as soon as the circumstances are right. Had they been, she’d have become a mom already. Nicole said “I have three goals for when I grow up and that’s either to be a fairy, a vampire or a mom. My best bet is mom.” We laughed. In terms of the small town activities and social life I was curious to learn about Nicole loves to hike and backpack and she just started mountain biking this summer. It’s a great area to mountain bike. While I was there I saw mountain bikers all over. There are also also plenty of hiking and camping opportunities nearby. Her boyfriend owns a cabin locally and the two of them spend a lot of time there. In the winters they snowmobile to it and cross-country ski using the cabin as a base camp. She doesn’t watch much TV but there’s a zombie show she likes. I mean, who doesn’t like zombies, right? Summertime social life includes a lot of barbecues with family and friends. In Crested Butte there’s a bar with Karaoke on Thursday nights which she enjoys very much. When I asked her what she would like people to know about CB South, the area or life in a small town she responded by saying “This life in a small town and this entire community is like my family. I’ve been all over the world and I’ve been in cities… and this is where I would choose to be out of everywhere I’ve been to. It’s the most incredible place I’ve ever seen.” When queried what makes it that way she said “The people, first of all are amazing… I feel like everyone is very, very welcoming here. When I have kids the entire town will look after them… and the beauty here is insane. Every single time I drive up from Gunnison it takes my breath away… I feel like it’s very magical here. I really do think that this is the most beautiful place in the world.” I think it fair to say Nicole hasn’t seen the whole world. She hasn’t been to Europe, for example, but it’s very clear she loves CB South and being there. This small town girl has been to Honduras, Africa, Chile, Argentina and Peru. The first thing she said about what she learned on her trips was that “people take a lot of things for granted” (I presume she meant here in the US) “even in Crested Butte”. The way people relate to death is also very different in places where she’s travelled. This was made very real to her when she witnessed the death of a friend who was trying to swim the Zambezi river in Africa but was unsuccessful. The local people celebrated his life and moved on with their own, something Nicole thinks we sometimes try to do here but at which we are not so good. Attitudes toward work also differ and part of your work includes being with your family members. She was talking about the attitudes in other countries. She also believes that there is more of a sense of community in the foreign places she’s visited. Her first trip out of the US, the one to Honduras, was with a youth mission when she was 14. She spent some time with missionaries, I’m uncertain if it was on that trip or one subsequent to it to which she was referring, but regardless, her mind was at one point changed about mission work when she “saw a beautiful, beautiful, beautiful group of people that were happier than most of the Christians I know here.” She didn’t go into detail but the implication would seem to be the non-religious Hondurans were happier than the Christian Americans and this sent the message that Christianity didn’t bring more happiness, perhaps it brought less. Whatever the precise reason may have been, Nicole changed her mind about missionary work and no longer favors it. 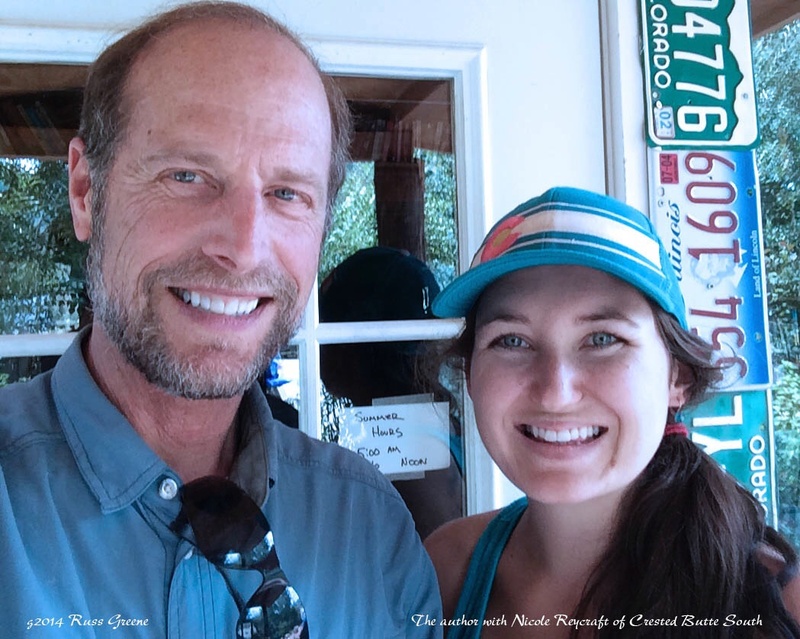 I’m happy that you gave me your time for this interview, Nicole, to explain a little bit of what it’s like for you being in the small town of Crested Butte South. Thanks, be well, and I hope your dream of children comes true soon. To my readers, if you’re in CB South, stop by Camp 4 Coffee. The coffee is good enough on its own, but all things are better when served by a beautiful woman such as Nicole. Interesting interview-fun to hear about the life and thoughts of a young person in a small US town. Tatoos? even in a small town? Lucky families that can and love to live close together.